Last week I was trying out the 18x optical zoom on my new Lumix camera. 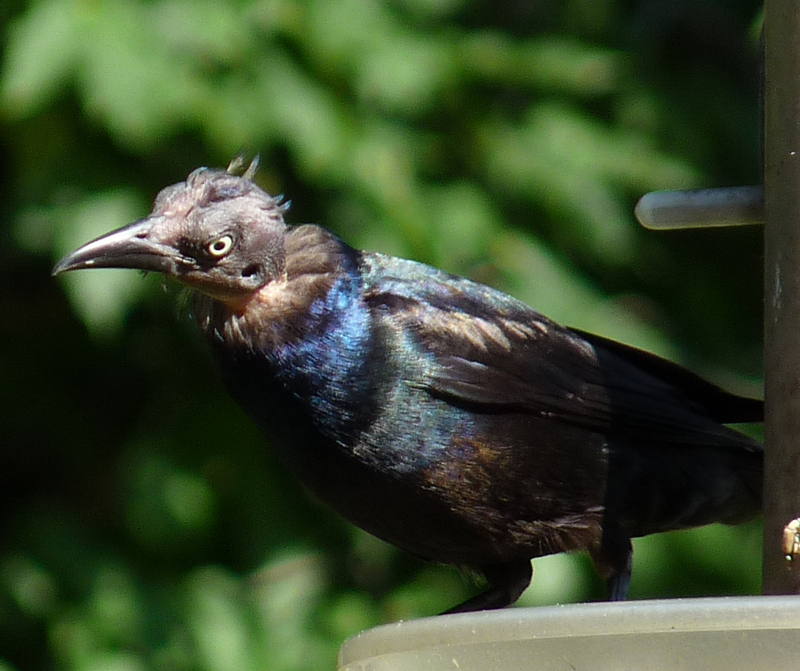 I snapped a few shots of a thuggish Common Grackle shoveling seed out of our birdfeeder. When I zoomed in on the camera’s display, I noticed its hideous head (see photo). Turkey vultures don’t have feathers on their head, but I was not expecting to see a denuded head on another species. It is not a good look for a bird. 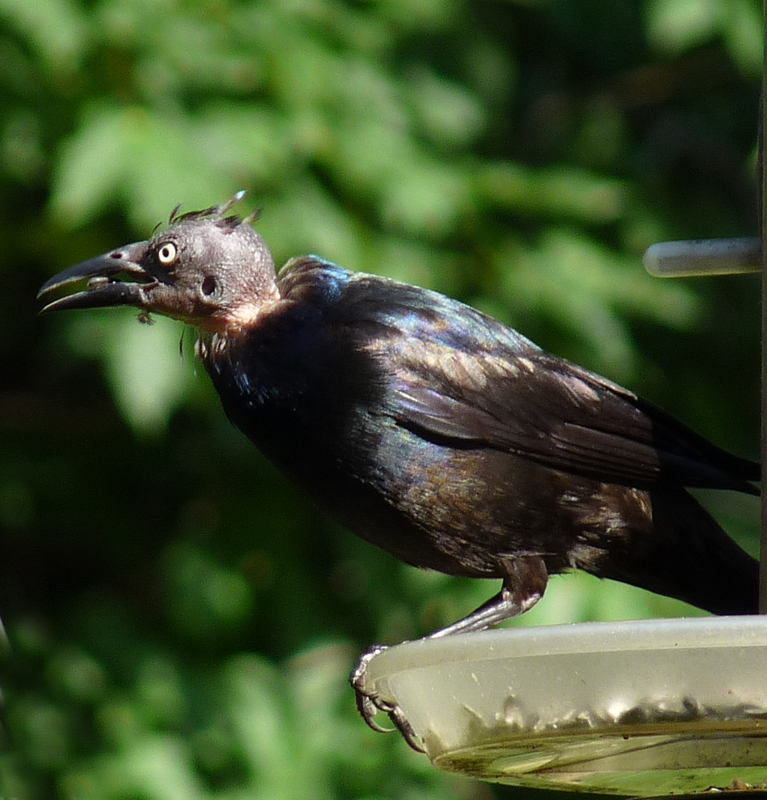 Apparently every year, people report cases of bald-headed birds at their feeders – typically Blue Jays and Northern Cardinals, and sometimes grackles. There are a couple of possible explanations for this phenomenon, according to the website for Project FeederWatch, a research and education project of Cornell Lab of Ornithology and Bird Studies Canada. The avian unsightliness might also be due to an attack of parasites. Feather mites or lice are tiny arthropods commonly found on birds. When they feed, they destroy the shafts of feathers. Birds preen to get rid of these buggers, but they can’t reach their heads with their beaks. Thus it is the most vulnerable spot, and probably the cause of balding, according to Mark Monroe, a biologist at the Hawk Mountain Sanctuary in Pennsylvania. It’s not clear to me why the phenomenon is not seen much on other bird species, since most birds have feather mites and lice. Project FeederWatch says bird balding could also be associated with some environmental or nutritional factor. With regard to the cause, “No one knows for sure, and the condition has not been well studied,” say the Project website. “Fortunately, new head feathers grow in within a few weeks. “ Otherwise, if this grackle were a male, he might have a tough time snagging “chicks” next breeding season. For more information on Project FeederWatch, see http://www.birds.cornell.edu/pfw/Overview/whatispfw.htm.